One of the simplest, but most often forgotten rules, is that of the principles of volume. Too much volume at one time will make you look larger than you are. Too skin tight can look a little tarty. Pretty simple isn’t it? But quite often if two garments don’t go together, and it’s not about colour, it could be that you’re trying to put too much volume on at the same time. Where can I get those boots??!!! Very true – especially if you are vertically challenged like me! My aim is to look as tall and slim as possible, so it’s particularly important for those of us who are only just over 5′ tall not to wear too much volume. I’m also in love with the boots!! So, so true! This is something I always keep in mind… and it took me so long to learn! From my teens and to my mid-twenties I wore too much volume, or to be precise, clothes in a size that was too big for me… I think a big part of that was due to my mother’s influence. Then I switched to more bodycon clothes… I think it was McQueen’s influence… low tight pants, short tight tops… that was my late twenties and early thirties. 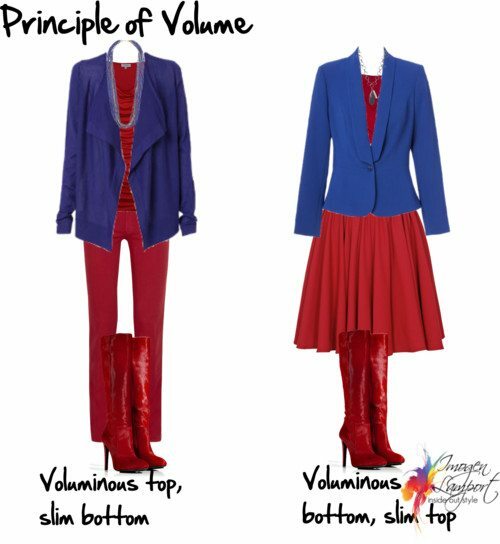 Now in my early forties I am happier with my personal style and this volume principle is one of the reasons why. It allows me to incorporate “younger” items in my wardrobe without feeling tarty or as if I had not checked myself in the mirror! Thanks Imogen for your super blog! Funny, I was just thinking about clothes that add volume and when I went here, you wrote a post about it. haha! But what do you do when you actually WANT to look “larger”? Im 5’5/168cm (average tall) and wearing children sizes in jeans and buttom garments (30/32 in europe size, I think thats 00 in US and 2-4 in UK, not sure about the Australian sizes) and average size on top (36, small) , so I’ve definitly no need to look slimmer or taller because it doesn’t look good on me. Like blending buttom garment, hosiery or skintone to foot wear – this only eggarate my body shape making me even more skinny!